The Mediterranean may look inviting, even idyllic, but as you know its mood can change almost without warning. This stretch of coast around the Cap d'Antibes is some of the busiest yachting waters in Europe. Antibes SNSM Lifeboat is the largest lifeboat in Alpes Maritime department, providing sea rescue around the Cote D Azur and sometimes on occasion called out almost as far as Corsica. The lifeboat relies entirely on donations. It is manned by a volunteer crew who give their time and risk their lives for no financial reward. They are on emergency call 24/7, 365 days of the year. We are ready to put to sea within 15 minutes of a shout. Trained and equipped for air sea rescue, medical evacuation, fire fighting and recovery. The boat is able to punch its way at speed through heavy seas up 27 kts, but its fuel consumption is considerable. A full fuel tank is 2500lts, which has to be paid for on top of that there is maintaining and insuring the lifeboat, training the crew, putting funds aside for a replacement (at today's price this would be 1.2 million Euros), are there are always further calls on our budget. The station is open for visitors on Saturday mornings, for donations of funds, Cheques in Euros made payable to: "SNSM Antibes", and send to SNSM Capitainerie Port Vauban, Antibes 06600. 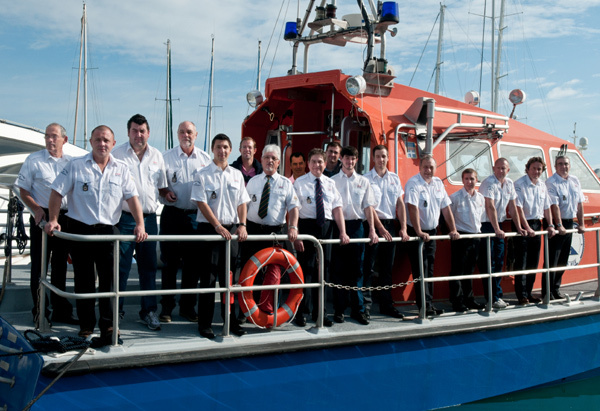 Antibes lifeboat is always in need of your donations. It costs about 80,000 per year to run the lifeboat. One tank of fuel costs 1,800 alone and we need to raise about 450,000 over the next 10 years just to replace the lifeboat. If you use the waterways between Antibes and Corsica this is your lifeboat. You can make a donation by sending a cheque made to SNSM Antibes. Post to SNSM Antibes, Capitainerie, Port Vauban, 06600, Antibes. You can also donate coins or notes in the traditional lifeboat collecting boxes located in various shops and pubs around Antibes.